My proverbial mouse is a little tired today. See I’ve had him (or her) running around a lot as I scrolled through my photos in search of which story to tell you this week. A digression, we should be glad it wasn’t a real mouse. For the record, I don’t do well with live rodents. Luckily I do better with the computer variety. I kept stopping on random photos and then moving on as I realized I couldn’t make a blog post around them. There might even be a blog post to come on the destination itself, but these particular photos wouldn’t be included because they wouldn’t further the narrative. So…I decided that a few them were going to see the light of publication simply because I liked them. Prior to heading up to the Arctic, Polar Buddy and I spent a few days exploring Oslo itself. The museum was enjoyable, and perhaps it would have been more enjoyable on a better day. It was pouring rain. And much of the museum is outdoors. Then I saw these vibrant school children. 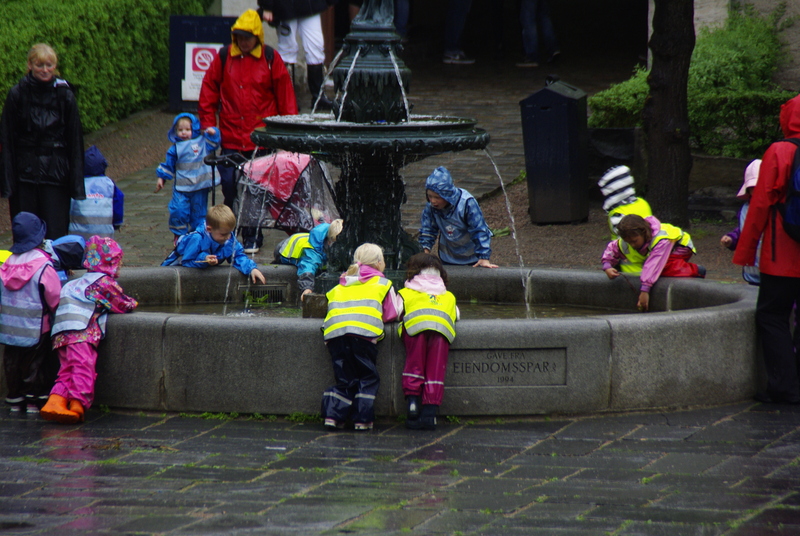 The rain and fountains were clearly the highlight of the afternoon. Plus, those outfits were priceless. It reminded me of when I was little, and I wanted nothing more than a rainy day (rare in California during the drought) to wear my raincoat, carry my umbrella and jump in a puddle. Note to self: Celebrate rainy days (literal or figurative). Wear something bright. I was recently in Cabo San Lucas with a close friend for vacation. I had been once before several years ago. There is a reasons for the popularity…it is beautiful and close, yet still away. 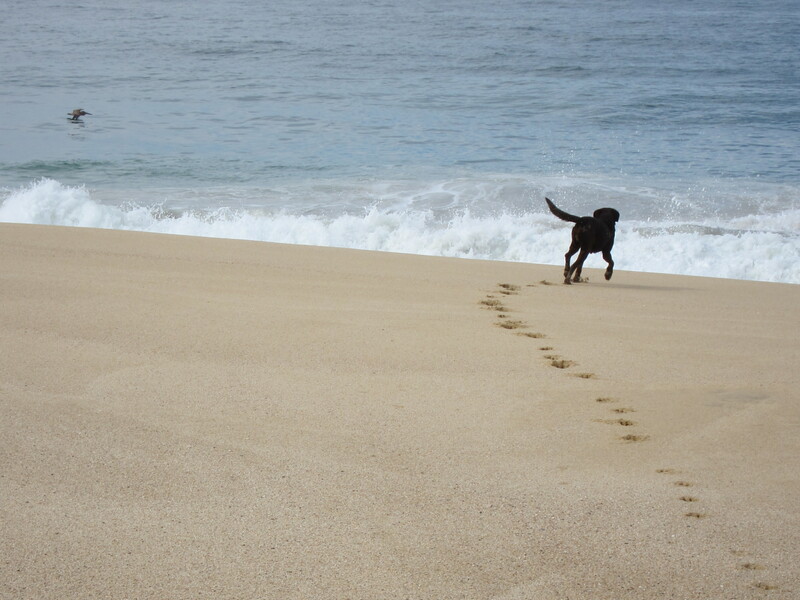 In my relentless quest to get off the beaten track, we asked a shopkeeper in Todos Santos for the “locals” beach. Sure enough, a barely marked dirt road off the highway led down to a stunning beach (Playa Los Cerritos, I believe) that definitely wasn’t a secret to locals. With good reason. 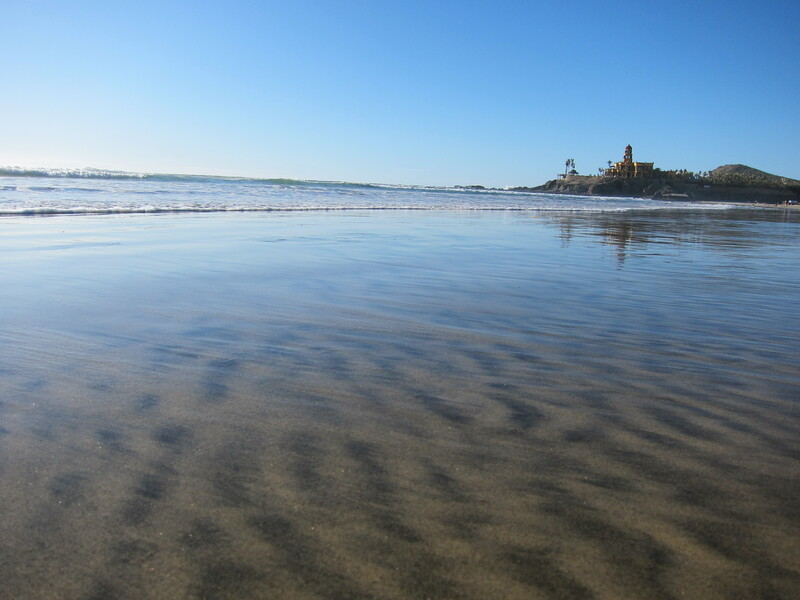 As I strolled along, close enough to misjudge a wave and get soaked, I noticed the pattern in the sand. Note to self: Sometimes beauty and wonder are right at your feet. On another day, my friend and I decided to do a guided horseback ride along the beach. I mean, why not? The company took us to a different beach, also on the Pacific side. There were some amazing cacti as we all rode down to the water. Now if only my horse had the same commitment that I did to making sure I didn’t end up in one of those cacti, it would have been great. There were no injuries, except to my pride. Plus, I got this photo of the friendly canine who kept us company. Note to self: Sometimes the dog has the best time. Sometimes life just happens and you end up in random beautiful places. One of my favorite travel companions happens to also be French. We stayed with her family while calling Paris home base to and from a trek to Nepal/Tibet in 2007. I also got to be part of her family. It was a rough gig (um, not). 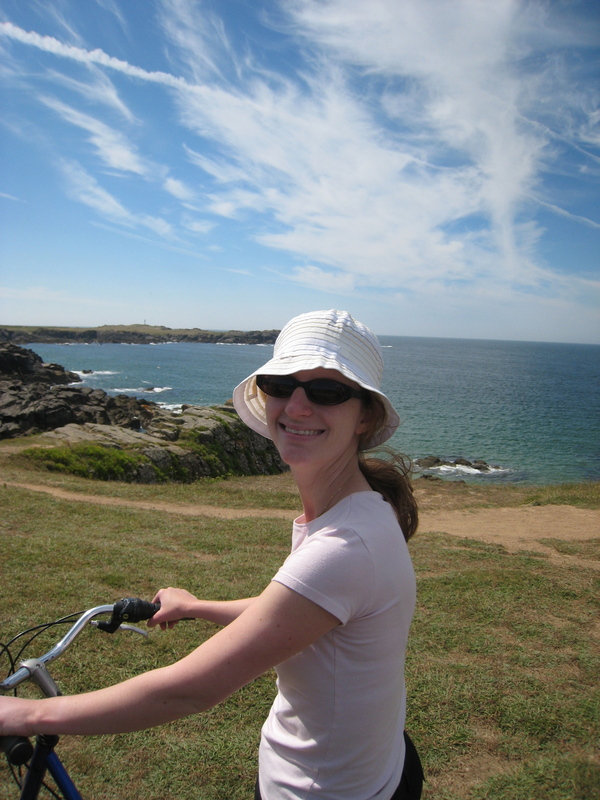 To celebrate her father’s birthday, we went to Ile d’Yeu, off the northwest coast. To explore the island, we rented bikes. There might be a picture of me from later that afternoon with chocolate all over my face from a nutella crepe. I can’t confirm that. Note to self: Just go with it. And crepes are always a good idea. I debated including this picture. My blog is upbeat, optimistic, and filled with a sense of promise. 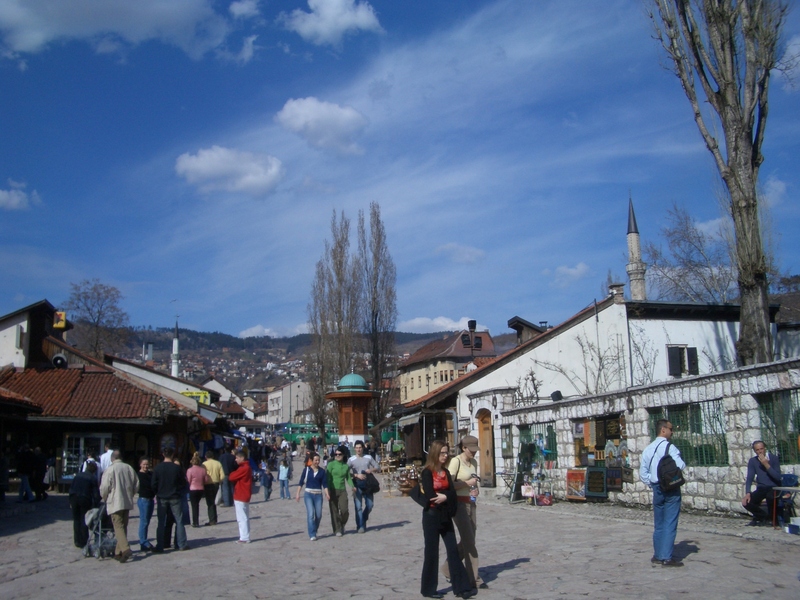 This somewhat bucolic picture of Sarajevo masks pain. It masks bombed out buildings, remnants of war. I somehow don’t feel qualified to comment on such a tender wound. So I’m taking a risk and sharing it with all of you anyway. This photo always reminds me that as travelers we have a responsibility to the people we meet, to the countries that graciously let us inside their borders. We have a responsibility to let ourselves experience and be impacted in an authentic way. No one said authenticity was easy. Note to self: Take risks, some big and some small. Be authentic. So there you have it. What are some of your random travel memories?